Hang your framed photo’s, portraits or most anything you need to affix to your wall easily and precisely with our New keyhole slot cutting template. No measuring needed with this template, simply line up the template on your picture frame and rout out your slot(s). The template has 6 different size slots to choose from depending on the size of your project and is made from clear acrylic to see exactly what you are cutting. Use this template with a 5/8" Short-Shank Guide Bushing, (specifically designed for 1/4" template stock) and a 3/8" Keyhole Slot Router Bit. 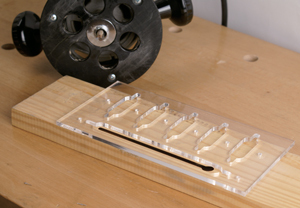 The router bit and guide bushing are not included with this template.